Where has the month gone? (Rhetorical question.) Why am I being besieged by companies/organisations telling me I must re-subscribe to their emails? (Non-rhetorical question, although I think I know the answer – *some people* are spreading panic about new legislation and the country is alive with the sound of knees jerking.) A small rant: there used to be an acronym in Ye Olde Internet Dayes: RTFM. I’m too polite to say what that stands for but you can always Google it. My point is, if you read the ICO website and the text of the new GDPR then you will know IF you need to ask for re-confirmation of consent. Or NOT. Meanwhile I’m almost looking forward to not getting all those emails I used to enjoy getting. In the last few weeks I’ve been suffering with back and arm problems which meant I had to limit my time on the computer. It’s all to do with posture, and related to the RSI I’ve had for nearly two decades. Nothing life-threatening, just annoying, and coinciding with the painstaking job of typesetting and formatting TRUTHS, the new Telltale Press Anthology (see below) not to mention endless need for posters and programmes for various concerts, workshops, recitals and assorted music-related ephemera. And five weeks of having work done on our garden. 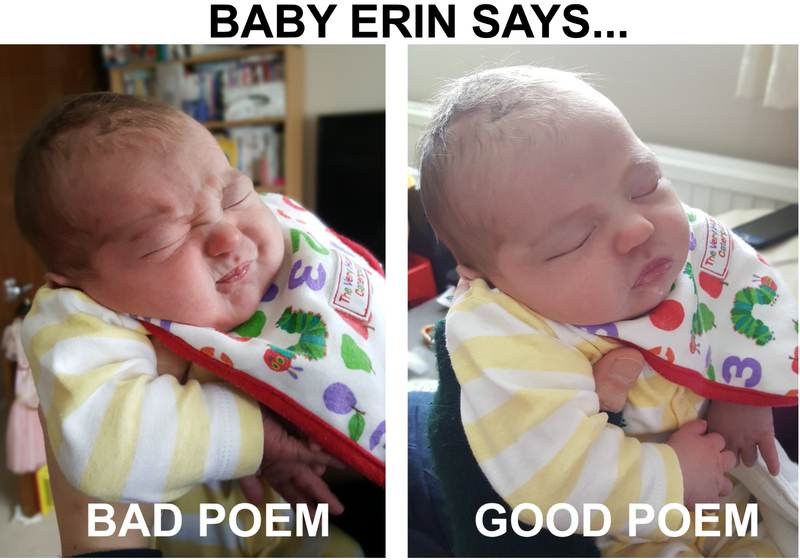 But HEY I am back on the comp (taking lots of breaks), the garden is finished, we have a new granddaughter (who I think is going to be a fine poetry critic), everyone is well and life is good! I had a blast reading at Needlewriters earlier in the month, and we’re currently planning our June 14th event which will be a South Downs Poetry Festival Special. That means that as well as our regular evening of readings, there’ll be an open mic to kick off the evening, and in the afternoon five of us will be offering poetry ‘surgeries’ (not as queasy as it sounds) to which we hope lots of lovely poets and aspiring poets will flock. More on that another time. Yes, it’s finally here – or it will be – (long story) – next Wednesday 25th April, 7.30pm, upstairs at the John Harvey Tavern in Lewes… a dozen or so of the contributors will be reading their poems on the theme of truth/truths, and much over-excitement will be had by all, especially those of us mad enough to have a) suggested it and b) put it together. Once more the excellent Hannah Clare has created a cracking cover. It’s a stonker of a collection, but of course I would say that. You’ll just have to buy a copy to find out! The technicalities of producing TRUTHS has revealed to me another truth: I have so much to learn about print publishing. There were issues. But I am confident it will be good. Come and see! Free entry. Here’s the Facebook event page. A few months ago I was wondering why I had nothing ‘forthcoming’ until it occurred to me I just wasn’t sending poems out. Duh. For some reason I’ve had a spate of sending to competitions rather than magazines, and being met with the sound of silence. But I’m slowly getting back on track. There’s one poem coming out in the next Interpreter’s House, which will be Martin Malone‘s last as editor, so I’m hoping there’ll be a launch somewhere that I can get to. Rumour has it that Martin is currently residing in a lighthouse on Shetland, clearly on a mission to move as far north as possible. So we’ll see. Then a welcome surprise yesterday – a letter from Ann Sansom to say they’d like two of the poems I sent them for The North. I’ve only ever had one poem in The North and it’s been years since I’ve sent anything there as I’d convinced myself my stuff wasn’t for them. So I guess it’s always worth trying again. Meanwhile I’d like to thank both Emma Lee writing on her blog, and Pam Thompson in London Grip for their thoughtful reviews of All the Relevant Gods, and Abegail Morley for this super mention at The Poetry Shed. A random selection… the March edition of Poetry and the Spring edition of The Poetry Review, in which I particularly enjoyed poems by Hannah Lowe, Ruth McIlroy and Rebecca Goss. Still to read the essays and reviews. Mary Ruefle’s The Most of It, a prose collection, although the stories (stories? somewhere between short stories and flash fiction) feel more like poems. I’m getting a lot of inspiration from this book. Also the Spring edition of Rattle, in which I thought I’d read two poems by Sharon Olds, which I loved, but they’re not there. So where did I see these two poems? I thought it was in a recently-arrived mag. But can’t track them down. Do you know? Stephen Bone‘s Plainsong (Indigo Dreams) is still on the ‘current’ pile – meaning I can’t resist dipping back into it (double-dipping?) before putting it on the shelf, and after a mention by Abigail Morley recently of Robin Robertson I’ve also got out my copy of Hill of Doors for a re-read and it’s paying off. Peter Raynard is currently on tour promoting his collection Precarious, and it’s one of those books I hesitate to use the word ‘enjoyed’ about as I rather felt I’d been pulled along by my hair to arrive slightly scathed at the end. It’s breathless stuff – the language comes at you with force, a fire hydrant of feelings. There’s a great deal of humour, especially in the poems towards the end, but the overall effect on me was unsettling – ‘exposing us all to unending rounds of worry’ (‘They always come out fighting’). 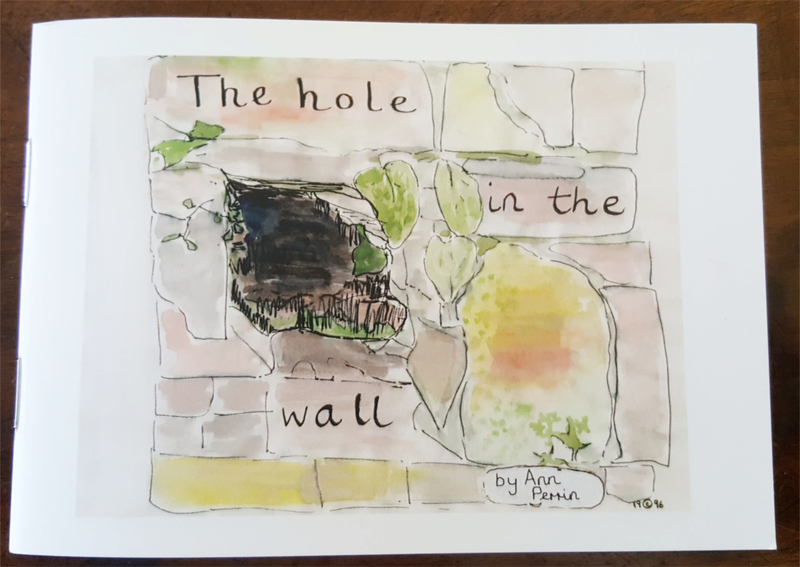 Look what Ann Perrin pressed into my hand the other day – a copy of her lovely illustrated booklet The hole in the wall, produced by none other than the Dry Stone Walling Association, completely charming and one I will look forward to reading to the granddaughters when they’re a little older. I also recently enjoyed Finishing Lines (Rack Press) by Ian Harrow, a very short pamphlet about illness, with a happy ending; ‘Come, Spring, make the difference.’ (‘Entreaty’). Yes indeed. I’m about to step outside and see for myself. Congratulations on activities and events with Telltale and being published in TIH and the North. Thanks Peter – unsettling in a positive way, of course! Thank you Elly. Much better than it was! Congratulations on poems and granddaughter! All exciting. I hope you are feeling some relief from the pain-that’s never conducive to writing. Well, not physical pain anyway. Did you mention the garden is finished? I think that’s the first time I have ever encountered garden and finished in the same sentence 🙂 Now to sit back and relax. Hi Cheryl – ha ha! Yes, well, let’s say the garden is finished in the sense of no more noise, mud and chaos! There’s a ton of planting to be done, but we’re in no hurry 🙂 And thank you for your good wishes. Shoulder/arm pain much improved.